To commemorate 25 years of service, each month this year the Armenian EyeCare Project will feature a key element of our organization that has allowed us to bring eye care to the people of Armenia. This month, we share the story of how the Project came to be. Let’s start at the beginning. The early 1990s was a tumultuous time in Armenia. Years of tragedy had taken a toll on the dark eyes of Armenia, devastated by wars and natural disasters. In 1988, the country suffered a catastrophic earthquake that took more than 50,000 Armenian lives and injured thousands more. The same year, war broke out between Armenia and Azerbaijan and lasted six destructive years. By the time Azerbaijan and Armenia had finally agreed to a ceasefire in 1994, 30,000 people had been killed and over a million displaced. During this turmoil, the Soviet Union collapsed in 1991 and Armenia declared its independence; the Commonwealth of Independent States (CIS) was created and the former Soviet republics were dissolved. The initial post-Soviet years were marred by economic problems as Armenia transitioned to a market-based economy, effectively crippled by the Nagorno-Karabakh War and Azerbaijan and Turkey imposing a blockade on the new republic. A nurse collecting water to save for later. During the early 90s, Armenia had access to water and electricity for just two hours a day. Roger V. Ohanesian, M.D., a Laguna Beach, California ophthalmologist, received his call by way of a fax that was sent to all members of the Armenian American Medical Society. The message asked established doctors in the Diaspora to provide medical expertise in Armenia. Dr. Ohanesian felt compelled to act and responded immediately. Scheduled to take a family trip to London in two days, the ophthalmologist changed his travel plans and instead booked a flight to Armenia. There, he met Dr. Sarkis Soukiasian, an ophthalmologist from Massachusetts, who also responded to the call from the Minister of Health. Dr. Ohanesian left just three days after receiving the fax and was able to bring with him $10,000 worth of pharmaceuticals and supplies. As soon as he and Dr. Soukiasian arrived, they began to treat those who needed eye care — many of whom were children and almost all were victims of war. 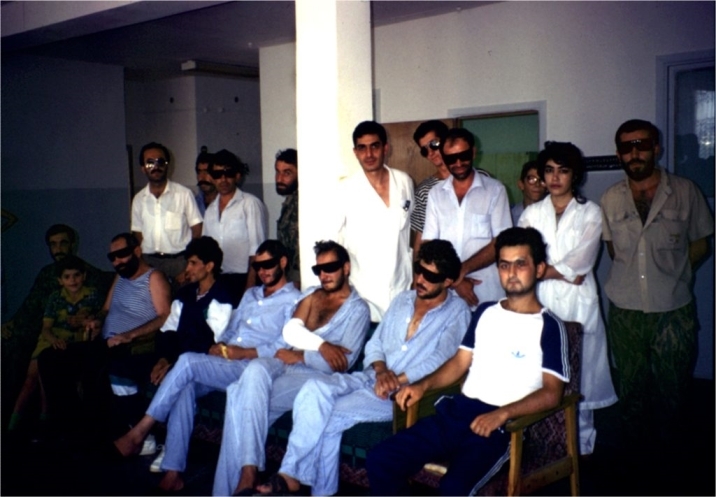 Armenian soldiers from the Nagorno-Karabakh War receiving eye care. 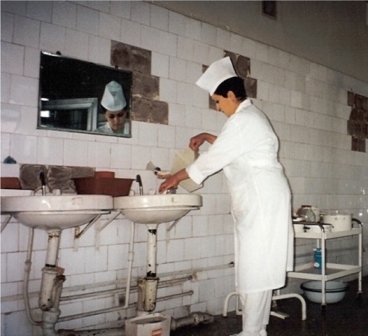 Conditions at the hospitals in Armenia were dismal. With just two hours of electricity and running water a day, Drs. Ohanesian and Soukiasian worked tirelessly to treat as many patients as they could. To save time, some days they would sleep fully clothed on a cot in the hospital. By the end of his two-week stay, Dr. Ohanesian had treated about 300 patients and performed 40 surgeries. But there was still so much to do. 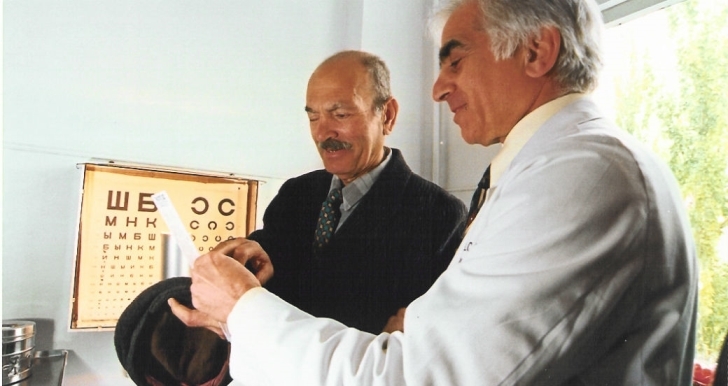 Dr. Ohanesian said, “I just did what I thought would be the best thing and that was to continue going to Armenia.” He subsequently founded the Armenian EyeCare Project. Since his first trip, Dr. Ohanesian has been traveling to Armenia twice a year to bring hope and sight to the Armenian people. On each Medical Mission, the California ophthalmologist recruits several prominent ophthalmologists with different subspecialties to teach Armenian physicians, treat patients and perform surgeries. To date, more than 70 ophthalmologists have traveled to Armenia, at their own expense, to fight blindness. Dr. Richard Hill, a U.S. ophthalmologist, posing with a nurse in Armenia after a successful surgery. On his missions to Armenia, Dr. Ohanesian also takes with him medical equipment and supplies generously donated by American companies including Alcon, Allergan, Bausch and Lomb and many others. These companies have continued to donate equipment valued at more than $60 million over the past 25 years. 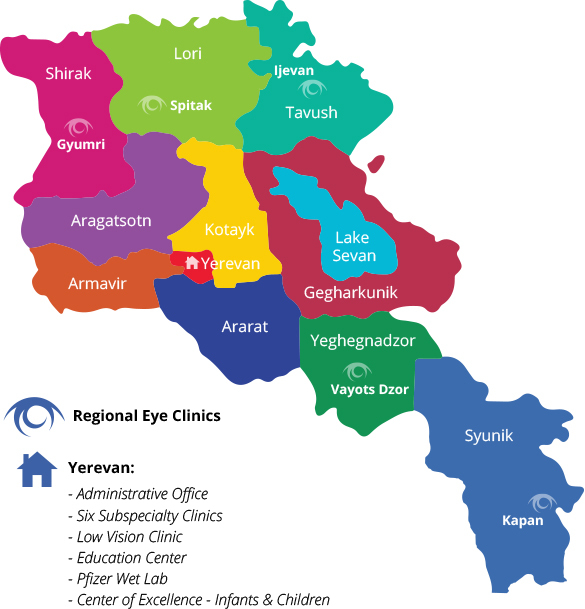 With each Medical Mission to Armenia — 52 and counting — the Armenian EyeCare Project works to make its vision a reality for Armenia — a country where no individual is without access to quality eye care; where Armenian ophthalmologists are trained to diagnose and treat eye disease at the highest level; and where preventable causes of blindness are eliminated through an emphasis on prevention and early intervention.